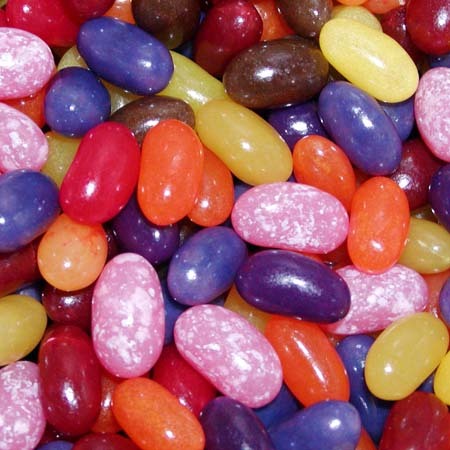 Home > Easter Candy > All Natural > All Natural Jelly Beans 12 oz. 12 oz. Bag of All Natural Jelly Beans with no artifical flavors or colors! Flavors include: Black Cherry, Orange Punch, Strawberry, Vanilla Bean, Grape, Lemon, Pomegranate, Blueberry, Peach, Apple, and Root Beer. Finally, some great all natural jelly beans. Really good! Sugar, corn syrup, cornstarch, dextrose, fruit juice concentrates (apple, lemon, tangerine, peach, strawberry, blueberry, raspberry, blackberry, grape, cherry, pomegranate), citric acid, pectin, sodium citrate, natural coloring (fruit & vegetable extracts, beta carotene, annatto, turmeric, riboflavin, caramel color, titanium dioxide), natural flavors, bees wax, carnauba wax, vanilla, confectioner's glaze.